The Soft Rider “The Pool” is online. 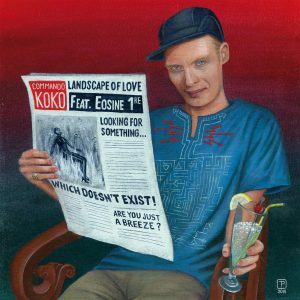 After many freaky cassettes, Commando Koko’s new effort is a 7″ all for the love of modern funk. Boogie dancers, be ready to shine in the Landscape of Love and cry to a refreshed new jack swing B-side. Commando Koko has many facets. Like a disco ball. He expresses his love of dance music in many different ways, always on the shady side of the beat… His live form is still very gear oriented with a collection of drum machines, analog synthesizers and cassettes in which a slight noisy approach electrifies an otherwise very groove oriented set. The stylistic range is wide, from old school house to electro funk to ballroom extravaganza, exploring sweet Rn’b and frenetic grime. No limit but the beat. Originally known as Der Kommissar for his illustration and poster artwork, he was also a bassist in the acid rock trio NED. His new effort is a 7″ released by S.K records and Atomic Bongos all for the love of modern funk. You can order the record via the BUY icon below. 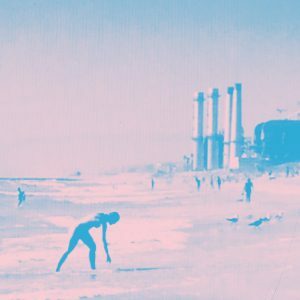 Inspired by both JG Ballard’s “Atrocity Exhibition” and California’s psychedelic luminescence, this first EP from The Soft Rider revisits synth-pop and electronic/industrial music through the prism of Los Angeles as fascinating as it is chilling. 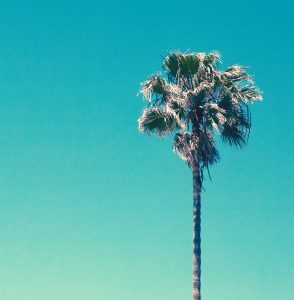 The freeways lined with palm trees and the reflections of a radiating sun respond to a pulsation set at 128BPM, pink-candy melodies and the distant echo of waves, metal and concrete. Somewhere between Giorgio Moroder and Throbbing Grisles, The Soft Rider dystopian disco describes a world where silicon dreams, ice cream parlours and eternal sunshine melt with hi-tech surveillance and survival strategies. Recorded between Brussels and Los Angeles, the record features vocals by K. Hoffstedt and A. Edelman and comes as 12″ EP edition and digital download. A super limited edition ( only 50 copies) Vinyl+ handscreenprinted beach bag is also available. Somewhere between Giorgio Moroder and Throbbing Grisles, The Soft Rider dystopian disco describes a world where silicon dreams, ice cream parlours and eternal sunshine melt with hi-tech surveillance and survival strategies. Radio Bongos 7! We’re so honored to have 12XU doing this month’s mixtape. An hour of obscure ebm, garage, industrial fun. 12XU is a french DJ that escaped the greedy mess lead by Macron to find inner peace in Vietnam. Former boss of Plastic Spoons records (Flight, Mess Folk, Laurence Wasser, Fresh And Onlys…), he also used to organise killer rocknroll shows in Paris with Louis and Christine. Endless Summer! This Month we’re very pleased to bring you DJ C Margarine’s mixtape about… FOOD!!!! Based in Berlin, she runs the collage magazine Glueheads and does workshops too. But better let the Lady talk to you in person: “For everyone here on Earth, I’m Anelor Robin, born in the south of France in the middle of pine forests and ‘foie gras’. But to tell you the truth my real name is Margarine and I’m from the planet Pluton, born from the uterus of a motherEgg, raised by weird creatures and my best friend was a GlueHead. In terms of my work, I will say that collage is my best recipe. I find inspiration in normal daily life, with a special tendency and tenderness for food, sponges, 70’s magazine, Roman Photo, and plastic ice cream spoons that I like to collect to give a new and different twist to life.